Mentioned in THE GAME, In the tradition of the international bestseller Manwatching, THE BOOK OF TELLS, by Big Brother's resident psychologist, reveals how you can read other people's minds - and your own. Communication theory teaches us that 80% of what we communicate is non-verbal. But do you know what you're saying? 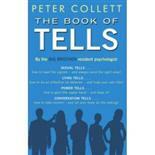 After reading this book, you'll understand what you communicate non-verbally.